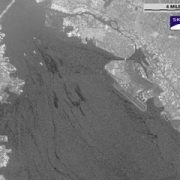 On November 7 a transoceanic container ship called the Cosco Busan hit one of the supports for the SF – Oakland Bay Bridge, tearing a big gash in the side of the vessel and spilling 58,000 gallons of heavy fuel oil into the Bay. At first the Coast Guard seriously underestimated the size of the spill, and it took a couple of hours before containment and cleanup crews were on the scene. By then the oil had spread, and over the following week it traveled throughout much of the Bay and even out into the Pacific Ocean, washing up on beaches over a wide area. 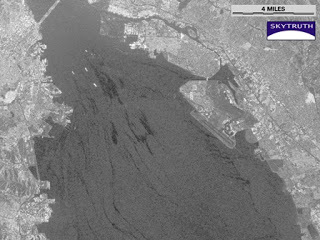 We had a radar imaging satellite (named, appropriately enough, “Radarsat“) take a picture as it orbited over the San Francisco Bay five days later. Defenders of Wildlife, Ocean Conservancy and San Francisco Baykeeper helped pay for the image, which showed numerous slicks in the Bay and beyond the Golden Gate. Check out our gallery and the press release from Ocean Conservancy, and this video showing why the failure to contain the spill promptly lead to a much more widespread impact. For you Google Earth users (and there are more of you every day! ), we also produced this KMZ file. The story told by the imagery is summed up well by Warner Chabot at Ocean Conservancy: “…containing the oil in the first two hours is 100 times more important than chasing it all over the San Francisco Bay for the next two weeks.” Two Bay-area stations used our images in their November 20 broadcasts – CBS 5 news at noon (watch the story), and ABC 7 news at 5pm. UPDATE 7/17/2009: The skipper of the Cosco Busan, John Cota, was just given a 10-month jail sentence for negligence leading to the illegal discharge of 53,000 gallons of oil into the Bay.